The Aemulor.com team dropped drobe.co.uk an email today to tell us how things are going with their 26 bit emulator, which was nice because we like producing content and you like getting up to date information. Aemulor is a nifty bit of software that runs on 32bit Castle Iyonix machines and enables the user to run old 26bit software. The development team strongly believe they're still on target for a January 2003 release and they've literally jump started the emulation software in terms of peformance. We're told Aemulor will also be attending the RISC OS Southwest show at the end of February and they also have a (time limited) demo version planned for an online release in "the next couple of weeks". 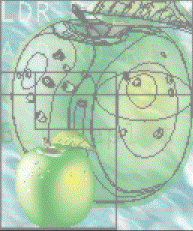 Aemulor.com likes using the classic Artworks apple graphic to informally benchmark their software as Artworks is a 26bit legacy application still used by many users employing their RISC OS machines for graphics work. In November last year, Artworks running over Aemulor would take 20 seconds to render the graphic. In December, they re-wrote the emulator and Artworks was rendering in 11 seconds (about RPC600 speed). Now according to Aemulor.com, with MW Software's 32bit Artworks rendering modules, the emulated Artworks takes 2 seconds. "As you can see the speed of applications running under Aemulor isn't going to be a problem! This is also using our 'worse case' test application (Artworks) which doesn't use any of the OS in its redraw code", the Aemulor.com team explained in their email. "Most other applications which use more of RISC OS to do their redrawing, will run at almost full 600MHz native speed." This is using a developmental build of Aemulor which only emulates processor instructions that are 32bit unsafe and allows all other code to be natively run by the 32bit XScale processor. The development team admit whilst it provides significant speed ups, it's also incompatible with software that used to work on previous versions of the emulator. Oops. Therefore, this recent superfast emulator core might not make it to the first release this month but they insist that it will eventually make its way to end users, such as a free downloadable upgrade. The current performance of the Aemulor software has been posted on the aemulor.com forums; this editor particularly enjoyed the forum topic "Who needs hardware emulation?" Indeed, who really cares about a hardware solution anymore? "We are keen to get as many applications as possible (and different versions of the same application) into our online compatibility database", the email continues. "To this end, we are offering to test any software you wish to send us under Aemulor." Now, the idea of people FTPing software for the Aemulor team to play with has alarm bells ringing in our ears but the team assure us all software will be deleted post-testing to comply with licensing rules. To send your (ie: the author or someone able to redistribute the software) 26bit software, FTP to ftp.aemulor.com with the username 'anonymous' and your email address as your password into the 'incoming' directory and upload your program for them to test and hopefully sort out any incompatibility issues. The other good news is StrongEd, Photodesk and Eureka (besides others) are in the Aemulor compatibility chart as working. Old timer web browser ArcWeb is also listed too, because that's obviously a priority piece of kit you'd want to run on your fancy new XScale machine. I'm sure Stewart's very hurt about the comment about ArcWeb. Certainly the speed of Aemulor now is very good news indeed. Haaaang on a minute ... 26bit Application running fast beacause all its work is done in modules which have been upgraded to 32bit?! These sort of distorted figures are just cheating the system! Oh. Fair enough. FWIW, the same thing renders in 4 seconds in Red Squirrel on my PC, and I've not got an amazing PC - cost half of what an Iyonix cost. I still hope that VA and ROL can get their act together to compete against Iyonix -- at least it'd have a decent OS! As an aside, a fair amount of the rendering code is actually still 26-bit even when using the 32-bit modules (because it's in the ArtWorks executable). This is why using the 32-bit modules *used* to have a dramatic effect, doubling the rendering speed. As the 26-bit portion is now much faster, the benefit of using 32-bit modules is now much less in % terms, but the 32-bit AWViewer still outruns emulated ArtWorks + 32-bit modules. Ian, why are you so set against the Iyonix? Why is everyone else so /for/ it? It's a bitter disappointment the way the whole fiasco has been handled. Not least the questionable roots of the operating system and the fact they're hurling everyone back to a crapulent RISC OS 3.7-alike system. The mad notions of "No Dynamic Areas" and soforth just go to further my opinion that it's not any future for RISC OS that I think is sane or have an interest in. There's other personal reasons, too. Everyone has a right to their opinion. Over all, RISC OS has completely lost its appeal for me due to all the ridiculous infighting an non-cooperation between folk (Castle, ROL, Microdicital, Windfall, Simtec, etc) -- a tiny market ripped apart by people who should know a lot better. Finally - nobody actually wants new RISC OS software anyway it seems. Certainly nobody seems prepared to pay for anything and the vocal disdain of RISC OS Select by many folk prove there's no point working for/with such a crackpot inbred indignant vicious set of folk any more. It's a shame, but that's the plain facts. I've found better things to do with my life than be hurt, disappointed and abused by this scene. The only reason I continue to comment is that good friends still battle on with it, and I support my friends. > Over all, RISC OS has completely lost its appeal for me due to all the ridiculous infighting an non-cooperation between folk (Castle, ROL, Microdicital, Windfall, Simtec, etc) -- a tiny market ripped apart by people who should know a lot better. This does at least *appear* to be true; I've always believed that the whole ROL/Hardware partners setup was fundamentally flawed. It's a pity they couldn't have all come together to form *one* company; maybe that's just naive of me. However, I'm hopeful for the Iyonix, if only for the fact that they seem to want to help the market by giving out free documentation. If only they and ROL can come together with some agreement about the future of Select for RO5, we might get somewhere. And ROL haven't spent many moons working on the PRM for Select on their website? Oh no, of course not. Tsk. Funny how people forget so quickly, isn't it? I've gotta agree with Ian about one thing (well, others too, but only one I'll comment on): nobody wants to buy RISC OS software. The number of people who say they support RISC OS and tell others to get Select etc, while at the same time clinging on to Impression like a limpet is terrible. I'm sticking with RISC OS for now, but only because I can't afford a PC and the software I'd want to run on it. And yet you do disparage people who don't like/buy Select, for whatever reason, even those who have bought it and simply don't like it. Speaking only for myself, Select offered nothing *for me* over RISC OS 4, so I didn't subscribe. > And ROL haven't spent many moons working on the PRM for Select on their website? Oh no, of course not. Tsk. Funny how people forget so quickly, isn't it? That's not "free documentation", is it? You have to subscribe to Select. You don't need the docs if you don't subscribe. Likewise for Iyonix -- they're only documenting their hacks -- no use if you don't have an Iyonix. ian wrote: > You don't need the docs if you don't subscribe. Likewise for Iyonix -- they're only documenting their hacks -- no use if you don't have an Iyonix. But surely if you want to write software that you can be sure works on everything, without actually owning one or the other, you need to know such information? Only a foolish person would write software for an Iyonix and not have an Iyonix to test it on. Likewise for Select. If you have a system to test it on, you have access to the docs required. I see no problem. Having just seen this thread, I have to say I'm not sure Stewart's going to be exactly cut up over those remarks. However, I'll point him at this web addy and see what he says. > crapulent RISC OS 3.7-alike system > mad notions of "No Dynamic Areas"
I always thought that you were a honest, technically competent RISC OS guy. However, these two statements of you are really strange. The first could be described a blatant lie, the second suggests that you don't understand the problems created by Dynamic Area usage, and the reasons why the DA hack was originally integrated into the OS. So if you're giving your software to someone else to test it's ok for them to give you a copy of the documentation? Where's the RISC OS 4.0 documentation?